On a July evening in 2009, five men sat down to gin martinis and medium-rare steaks at Harris’ Restaurant in San Francisco’s Nob Hill neighborhood. Two of the men were there to pitch a proposal: a consultancy involving the Anchor Brewing Co., the oldest independent brewery in the United States making small batches of beer with traditional ingredients. 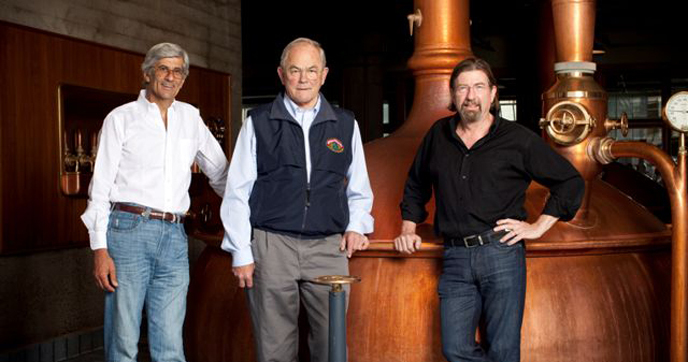 Keith Greggor and Tony Foglio had made their marks and money in the spirits trade. They met at the precursor to Diageo, the beverage behemoth that came to control brands such as Johnnie Walker and Captain Morgan, not to mention Guinness beer. Starting in 1998, they built up Skyy Spirits into one of the world’s better-known liquor concerns. In 2007, the pair sold their interests in Skyy to Milan-based Campari. Greggor then formed the Griffin Group, a boutique firm headquartered in Novato, CA, looking to invest in the various alcoholic-beverages industries; Foglio soon joined him. Their first foray into small-batch beer was a minority stake in BrewDog, the Scottish brewery noted for its cheekily controversial brand names such as Speedball, a nod to the heroin-and-cocaine cocktail. Greggor and Foglio were looking to branch out beerwise from there, including through a new consultancy they called the Center for Excellence, which would work with the portfolios of existing companies such as Anchor. To that end, John Fisher, an investment banker they knew, connected them with another acquaintance of his, Fritz Maytag. Maytag had famously rescued San Francisco’s Anchor Brewing Co. from oblivion in August 1965 and started the Anchor Distilling Co. in 1993. His 1965 move unwittingly sparked the modern era in American brewing—which made his decision to sell one of the biggest open secrets in the industry by the time of the 2009 dinner at Harris’. The 71-year-old Maytag had put out the first feelers four years before, but was none too pleased with the responses. Some potential buyers hinted they would move Anchor out of San Francisco, to a cheaper location. Others might lay off employees, some of whom had been with Anchor for decades. Negotiations continued through the rest of the summer, into the fall and through what passes for winter in the San Francisco Bay Area. By late April 2010, five years ago this month, Anchor had an announcement to make. “These are the right guys,” Maytag said during a National Public Radio interview on April 30. The sale price of the brewery was never disclosed nor was that of Anchor Distilling, which Maytag also sold to Greggor and Foglio. Certain other things, however, became clear rather quickly, chief among them that Anchor would stay in San Francisco—and would, in fact, expand. Best of all possible worlds, since Anchor wasn’t bought out by a macro, has stayed in the city as you said, has expanded its range since the purchase, and makes great porter. I still plump for the Steam and the Porter as the best of the line, preferably on draft in town.